CoreLogic released the Q3 2011 negative equity report today. CoreLogic ... today released negative equity data showing that 10.7 million, or 22.1 percent, of all residential properties with a mortgage were in negative equity at the end of the third quarter of 2011. This is down slightly from 10.9 million properties, or 22.5 percent, in the second quarter. An additional 2.4 million borrowers had less than 5 percent equity, referred to as near-negative equity, in the third quarter. 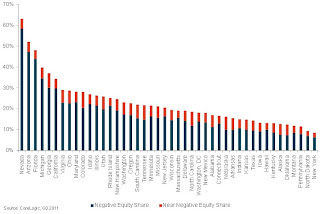 "Nevada has the highest negative equity percentage with 58 percent of all of its mortgaged properties underwater, followed by Arizona (47 percent), Florida (44 percent), Michigan (35 percent) and Georgia (30 percent). This is the first quarter that Georgia entered the top five, surpassing California which had been in the top five since tracking began in 2009. 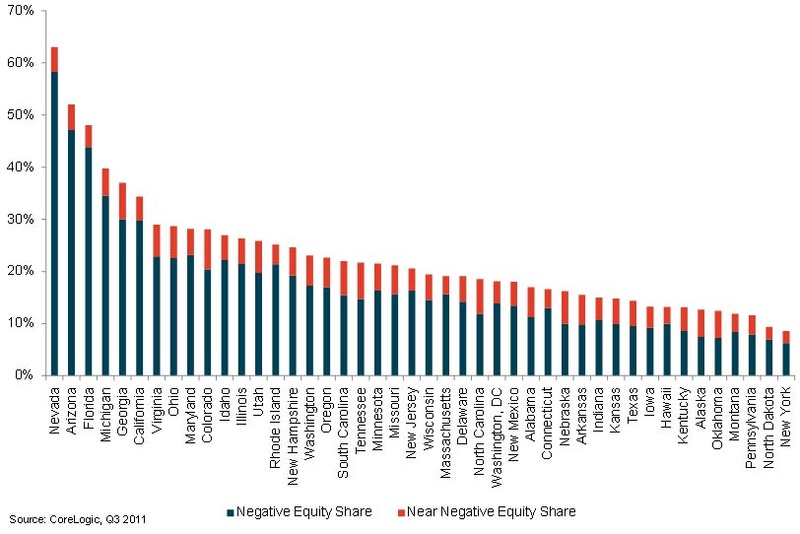 The top five states combined have an average negative equity ratio of 41.4 percent, while the remaining states have a combined average negative equity ratio of 17.6 percent." 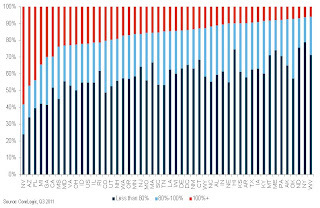 The second graph shows the distribution of equity by state- black is Loan-to-value (LTV) of less than 80%, blue is 80% to 100%, red is a LTV of greater than 100% (or negative equity). Note: This only includes homeowners with a mortgage - about 31% of homeowners nationwide do not have a mortgage. 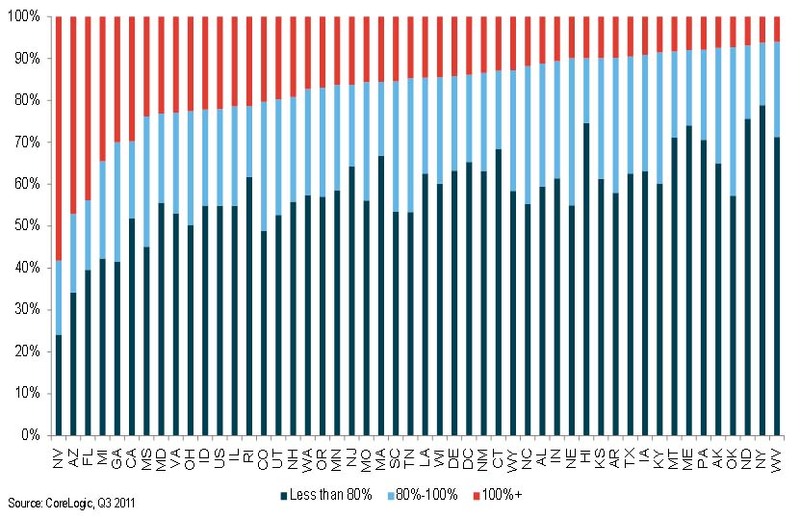 Some states - like New York - have a large percentage of borrowers with more than 20% equity, and Nevada, Arizona and Florida have the fewest borrowers with more than 20% equity. Some interesting data on borrowers with and without home equity loans from CoreLogic: "Of the 10.7 million borrowers in negative equity, there are 6.3 million first liens without home equity loans that have an average mortgage balance of $222,000. They are underwater by an average of $52,000 which equates to an average LTV ratio of 131 percent. The negative equity share for the first lien-only borrowers was 18 percent, and 40 percent had an LTV of 80 percent or higher. The remaining 4.4 million negative equity borrowers hold first liens and home equity loans with an average mortgage balance of $309,000. These borrowers are underwater by an average of $84,000 and have an average LTV of 137 percent."